Don’t Stop Marketing @ the Show! Many companies think that once the pre-show mailings are out the door , they can cease marketing efforts once they hit the show floor. But in actuality – this is when your marketing efforts really need to go into high gear! When you engage in your normal day-to-day marketing you are reaching customers and prospects in their offices. But at the show, you have the unique opportunity to engage in some meaningful face to face discussion. Many pre-show lists are notoriously inaccurate. So if all you are using to lineup appointments or booth traffic is this list– you really could be missing out on valuable opportunities. Today Word of Mouth is all about the exchange of information. Whether it is talking, mailing, sharing, liking, posting, tweeting, pinning, or viewing you need to continually be front & center. Most trade shows have set up Twitter pages for their event, or at least have a hashtag (i.e. :#showname) that references the show. While you are setting up your booth, be sure to check your smartphone’s, tablet, or laptop web connection on the show floor to see if you have access. If you do– then tweet away. If you do not then be certain to have members of your staff make their way to either a location where you can gain internet access or visit one of the business centers normally setup at shows. On Facebook–frequent either the show page or the association page. Hopefully you have taken the necessary steps to gain followers on your own page where you should be vocal and frequent. Again, run a Facebook only promotion. Whether you are Instagram-ing or using Pinterest…give people a visual of a new product at your booth or a unique aspect of your booth that can’t be found elsewhere. 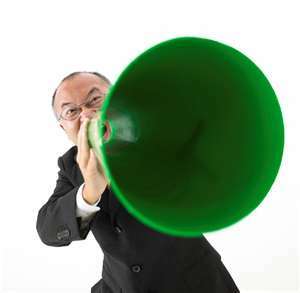 Social Media at the show is the equivalent of a bullhorn–be loud, be visual, and be frequent! Your phone is a sales tool–so use it! Again as noted above, you need to check your access level on the show floor where coverage is often spotty at best in many cases. Your phone can IM. Your phone can text, email, and check in. Your phone can communicate. As you collect leads in your booth don’t stash them away for contact when you get home–use them at the show. Whether you use a cloud-based email service, have staff back at the office to send emails, or simply sit in your hotel room– send emails to all the leads that stopped by your booth that day. Most people assume that they’ll get some sort of post show communication, but most will be pleasantly surprised to get a “thanks for stopping by” while they are still at the show. Within this email note any special events, presentations, etc that may still be upcoming in the next days. Or note a new product they may not have seen (i.e. : If you didn’t see how our new product can save you big bucks–then contact me now to set up a private demo tomorrow!) This gives attendees to come by again. Your lead cards are worth their weight in gold. Make sure that you have taken the time to develop a card that will work to generate new sales and have a set program in stone as to how your leads will be processed once you get back to your office. If you are using the badge scans, then make sure you have taken the time to really understand what you are getting, when you will be getting it, and if a modest upgrade in services might net you a big time savings and allow your staff to hit the ground running when it comes time to smile and dial! Many badge scan systems allow you to get daily downloads of visitors with contact info. Confirm with the actual visitor that the info associated with their badge is the correct information to actually reach them–if not get their business card! You may have spent months planning your show. But what happens while you are actually there is really what’s going to determine the ultimate ROI on your efforts and investment. Don’t let sales slip through your fingers by not continuing your marketing efforts to the exhibit hall, parties, receptions, presentations, show hotel, and more! the bottom line is — don’t stop marketing @ the show! This entry was posted in BotB Marketing, BtoC Marketing, Business Marketing, Direct Marketing, Marketing, Marketing Plan, Social Media, Trade Show, Trade Show Marketing, Video and tagged email marketing, eMarketing, lead generation, lead marketing, marketing, mMarketing, mobile marketing, social media, trade show. Bookmark the permalink.